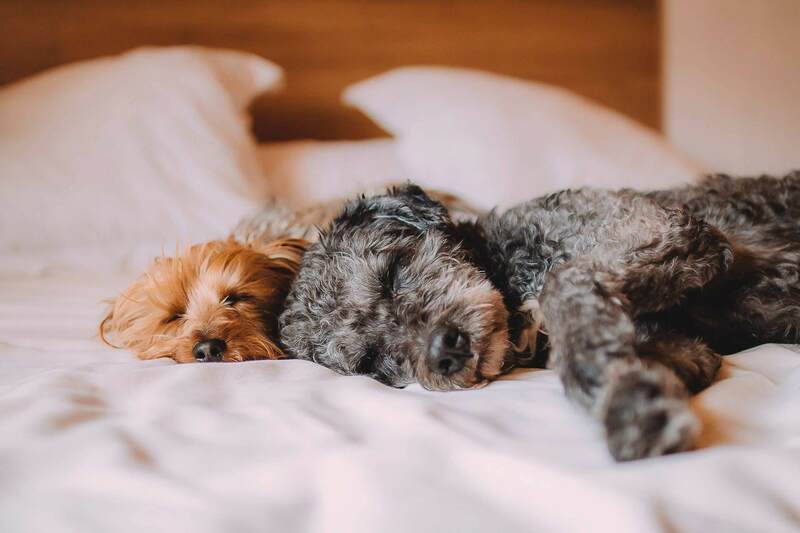 Are you aware of the benefits that come when sharing the bed with your dog? We have the best tips on how to make you both happy! It’s bedtime and your pooch wants under the covers with you: yes or no? This is really an issue of personal preference. Before deciding if the dog sleeping in bed is a good idea or not, consider the following. As pack animals, dogs need to satisfy their instinct for safety and comfort by gathering around their pack mates. Snuggling up to you makes them feel safe and acknowledged. One of the reasons why your dog wants to sleep in the same bed as you might be due to separation anxiety. 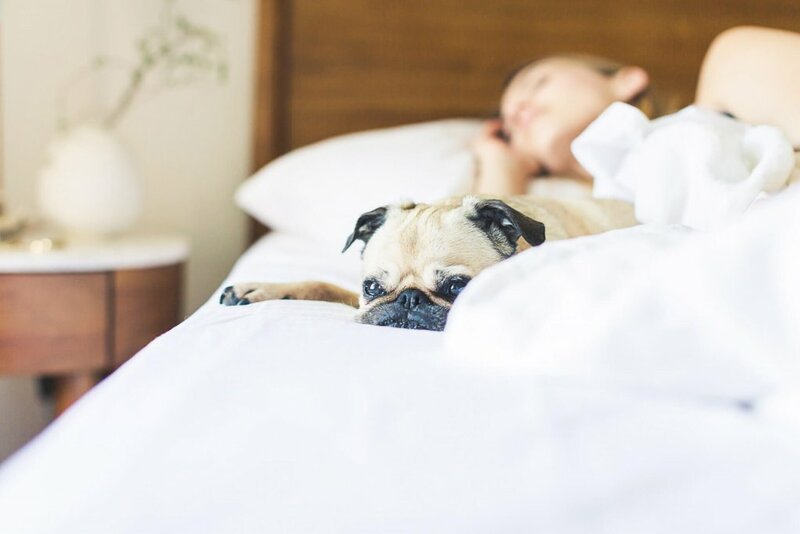 Once allowed in your bed, your dog will find it hard to sleep alone again. By staying close to you, your dog shows how much he trusts you. Their warmth gives you comfort and makes you feel protected. Helps fight depression and insomnia. Lowers stress and anxiety in both kids and adults. Increases the flow of hormone oxytocin, the bonding hormone, which strengthens the connection between you and your quadruped. If your dog shows too many signs of aggression or dominance, it is important to keep strong boundaries around personal sleeping spaces. If you suffer from breathing problems or strong allergies, sleeping solo is a no-brainer. Minimizing contact with dog hair, dust and other animal allergens is necessary. Some dogs love to sleep outside in their dog houses. They acclimatize to every environment which keeps their immune systems strong and their guarding instincts stay sharp. If you’re concerned about your dog sleeping outside, use a GPS tracking device on your dog’s collar. This way, you will always be able to see its location and feel confident of your animals’ safety. Dogs come in all varieties and they have different sleeping behaviours as well. Most dogs will sense when the family is settling down for the night and will likely be the first to put their head down. If your dog has difficulty with this, it will be up to you to familiarize it with bedtime. Start the training off by rewarding your dog for using its own bed. Rewards can include verbal praise or small doggy treats. Next, put your dog on a leash, walk to its bed and give your pooch the chance to get comfortable. Give a clear command such as “Go to your bed” and reward your dog for lying down. If your dog gets up, repeat the command and only offer treats once it lies down again. Consistency, patience and repetition of this “game” will guarantee both of you a good night’s sleep. Going for a walk just before bedtime or placing his favorite toys onto its bed will aid with compliance. A comfortable dog bed decreases the chances of animal diseases like rheumatoid arthritis. Choose the right size and shape! Your dog’s typical sleeping position will indicate to you the most suitable dog bed. Fringes are made for the dog who likes to snuggle and rest its head on a supportive structure like a pillow. However, rectangular dog beds without fringes or dog pillows are also ideal for your canine friend who prefers a lot of space and loves stretching out. Material & filling: the preferred external fabric is pleather as it’s washable, scratch-resistant and does not collect fur or odor. The bed material should relieve the pressure of gravity on your dog’s body. Firm pillows and fillings might not take the load off your four-legged friend, especially if they are older or have injuries. Cleaning: A dirt-resistant fabric will reduce your workload in maintaining a clean bed. When washing the fabric, don’t use a product with fragrance or fabric softener. Find the right spot: Dogs are pack animals and therefore love being surrounded by their families, even when sleeping. Ultimately, you choose whether your furry baby shares the human bed or has its own. At the end of the day, ensuring you both have a good night’s rest is the most important thing. Sweet dreams! Like what you’ve read? Share it with your friends!